Wilfried Schmidt Maschinenbau of Tübingen, Germany makes several headlights for 6 volt dynamo systems. Their latest is the Edelux II which produces the brightest beam available at 90 lux at 15 kph, the German standard for lux measurement. The beam is shaped much like a high quality automotive low beam, bright at the top then getting progressively dimmer towards the bottom, resulting in extremely even illumination of the road ahead for the cyclist. It puts most of the light further down the road so you can see at a distance when descending a hill, and there's still plenty of light close to the bike. The Edelux II has an all aluminum housing and a high quality hard glass lens instead of a plastic lens, which is common on other headlights. 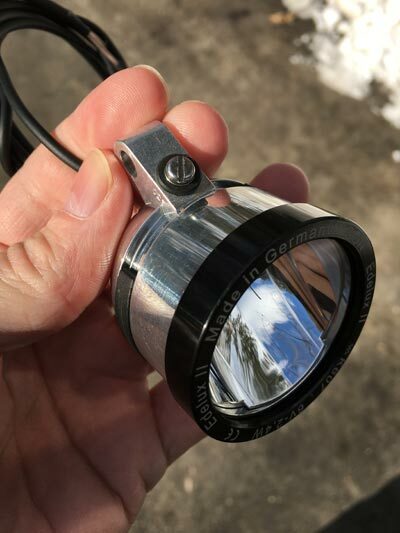 For the winter commuter riding on sanded and salted roads, the Edelux II lens will remain clear for many years without clouding up from sand kicked up by passing cars. 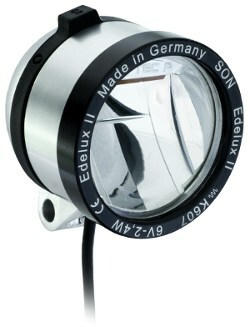 Like the original Edelux, the Edelux II uses a mirror that Schmidt buys from their friends at Busch & Müller. The original Edelux uses the Busch & Müller IQ-Tec mirror, introduced in 2007, and the Edelux II uses the new IQ Tec P mirror, introduced at Eurobike, August, 2013. This new mirror projects a much wider beam than does the original, about twice the width. Yet, with new brighter LEDs, the lux measurement is still higher. So the road ahead is not only illuminated with a much wider beam, it's also a bit brighter. But there's one more thing about this new headlight that is just extraordinary. 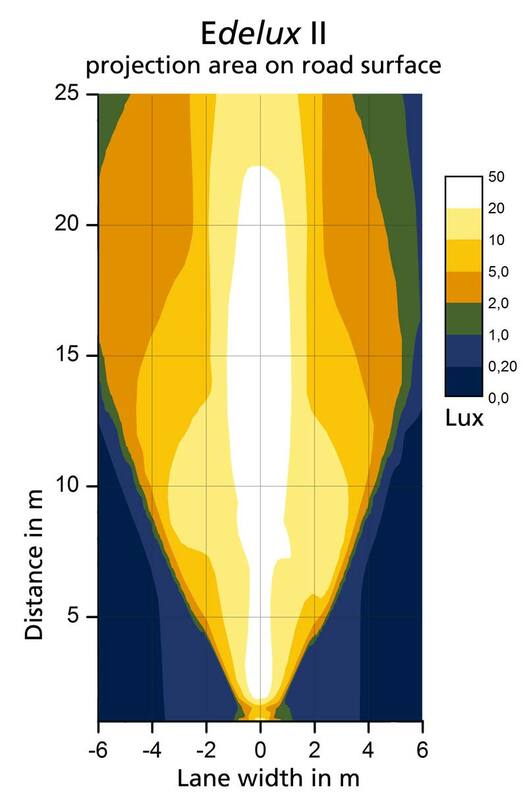 In order to illuminate the road ahead evenly, there needs to be a smooth increase in the projected light from the bottom of the beam to the top. 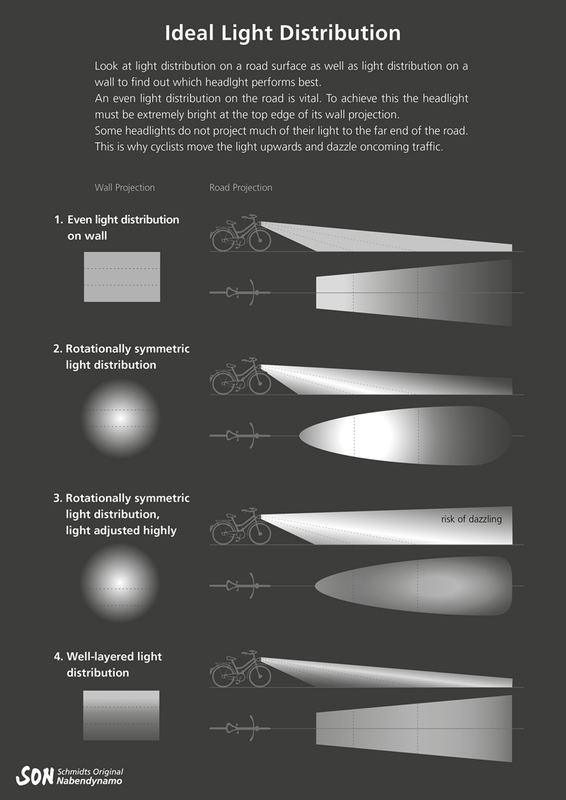 The further the light has to go, the brighter it needs to be at the source (the headlight) in order for the road surface to be evenly lit from the viewpoint of the cyclist. 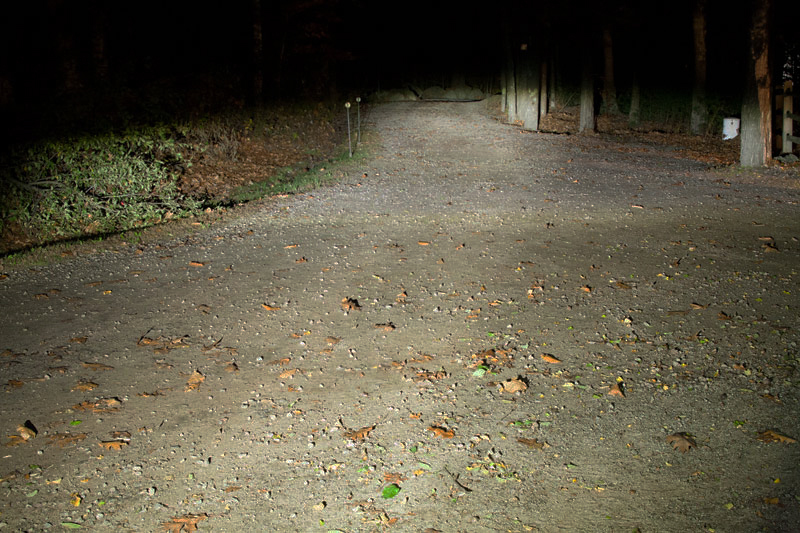 The older Edelux with IQ-Tec reflector did what I thought was an admirable job of producing an evenly lit road surface. But this new beam is even better in that regard, while still being so much wider and taller. Why is this important? If the road surface close to the rider is brighter than the road at a distance, your eyes will have more difficulty making out details on the road at a distance when you're riding fast or descending a hill. On a fast descent, the further away you can see clearly, the more time you'll have to react to whatever it is you're approaching. Here's a photo I made of the Edelux II beam from the rider's viewpoint. And here's a diagram showing how the beam is projected. "M" is for meters. The Edelux II is available in polished aluminum finish, silver anodized finish, black anodized finish, and anodized in the same red color as the Rohloff hubs and red SON hubs. As of 2018, we also have several other colors. See below. A 60cm wire is ideal for most bicycles when mounting the headlight at the fork crown. A longer wire is usually needed when mounting at the handlebar. Order the Edelux II with a 60cm wire with 4.8mm connectors for the SON hubs, or with a 140cm wire and loose connectors. You can also specify any length up to 140cm and we will install the 4.8mm female connectors for the SON hub for you when you place your order. We do not charge our retail customers for attaching the 4.8mm female connectors. The Edelux II colors listed below only come to us from Schmidt with the 140cm wire and no connectors attached. Let us know when you order what length you would like the cable to be. 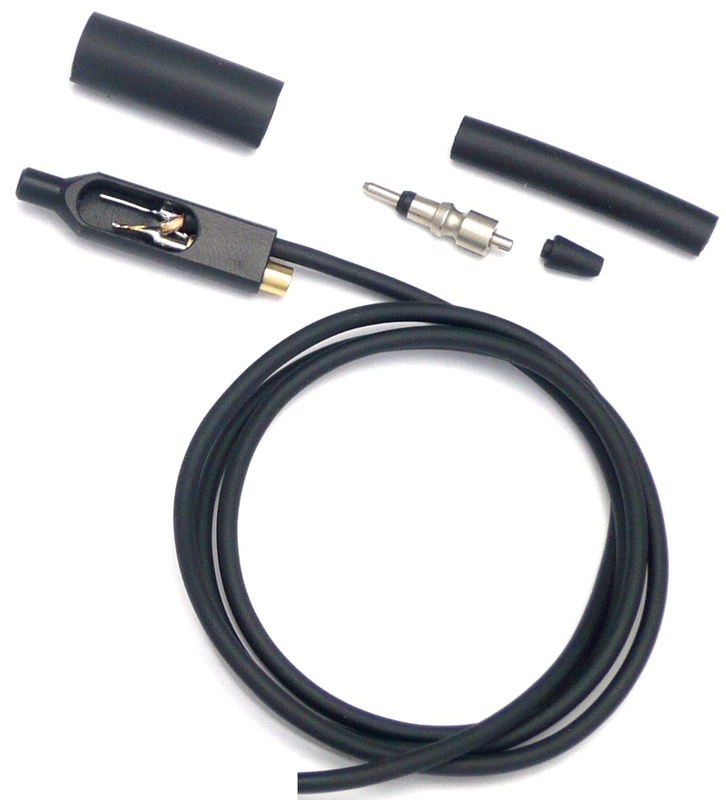 For our retail customers we'll cut it to that length and attach the 4.8mm connectors for no additional charge. The SON Edelux II can also come fitted with Co-Axial Connectors about six inches from the hub. These make it easier to connect and disconnect the wires to the hub when installing or removing the front wheel. 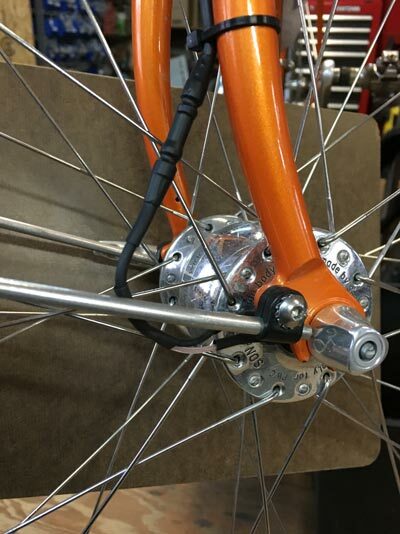 The short wire stays attached to the SON hub, so you only connect and disconnect at the co-axial connection, which is easier on your fingers than using the direct connection at the hub axle. The co-axial connectors are waterproof. We sell these co-axial connectors individually, and installed on a co-axial wire. If you're handy with soldering electronic parts, you can probably install these yourself. If not, send us your headlight and we'll do it here. If you have a Busch & Müller headlight with their dual strand wire, we'll splice in some Schmidt co-axial wire and then install the connectors. 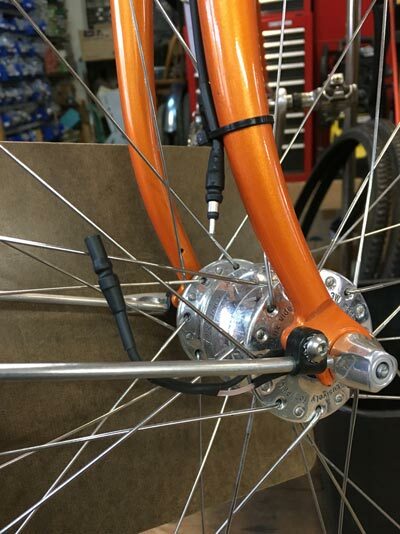 We stock a short cable, as seen above in the photo of my orange bike. 4.8mm connectors at one end to attach to the SON hub, and FEMALE C0-Axial connector at the other end. A loose MALE Co-Axial connector is included. Solder that to the end of your Schmidt co-axial wire and you're good to go. We have a second version using piggyback connectors at the hub end for people using a ac to dc charger for keeping their gps or mobile telephone charged on tour. For 2018, Schmidt is offering a new way to connect your headlight to the SON hub. Instead of two 4.8mm female spade connectors at the hub end of the wire, it has a male Co-Axial connector. 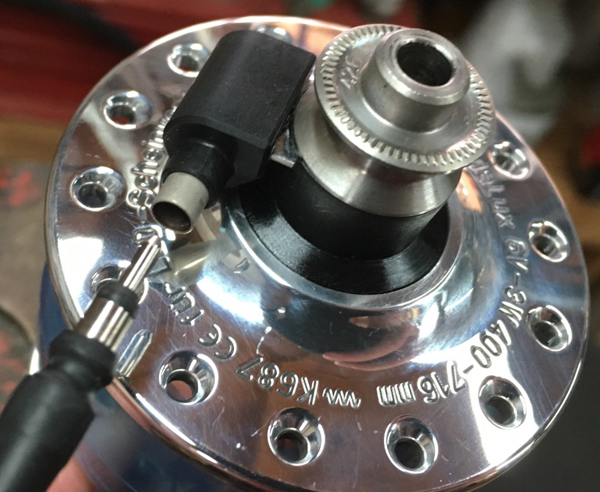 And then an adapter, the "Co-Axial Adapter" is placed onto the female 4.8mm connectors embedded in the hub axle. That Co-Axial Adapter is left on the hub axle; it's a fairly tight fit and won't fall off. 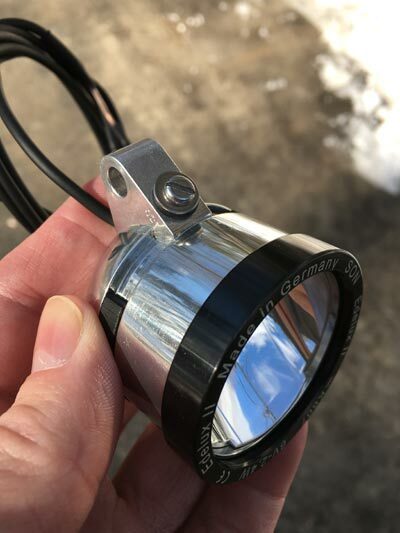 Now, when you take the wheel on or off your bike, you connect or disconnect the male Co-Axial connector on the end of the headlight wire to the female Co-Axial connector that is embedded in the Co-Axial Adapter. 60cm cable is for mounting headlight at fork crown on most bicycles. 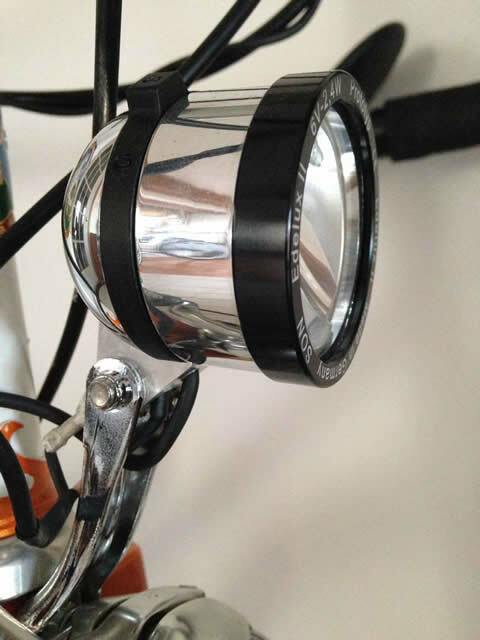 100cm cable is for mounting headlight at the handlebar on most bicycles. Other lengths can be made by special order for a small upcharge. We can also provide the Edelux II in red, blue, light green, dark green, gold, orange and pink with Co-Axial Adapter by special order. Want to have a charger wired to your SON hub along with your Edelux II headlight? And want to be using the Co-Axial Connectors and Co-Axial Adapter? We thought you might. The Y Junction comes two ways. One way has an 80 cm long wire to reach the hub dynamo with the Y Junction positioned somewhere below the handlebar. This is ideal for when you have the headlight mounted on the handlebar. You put a Co-Axial Adapter on your hub. The end of the 80 cm wire has a male Co-Axial Connector attached. The Y Junction is positioned along the wire between the SON hub and the headlight. The Y Junction provides a female Co-Axial Connector at its lower end. You take the wire running to your charger and install a male Co-Axial Connector to its end and plug it into the Y Junction. Download a PDF showing how the Co-Axial wire from the headlight is soldered to the Y Junction. 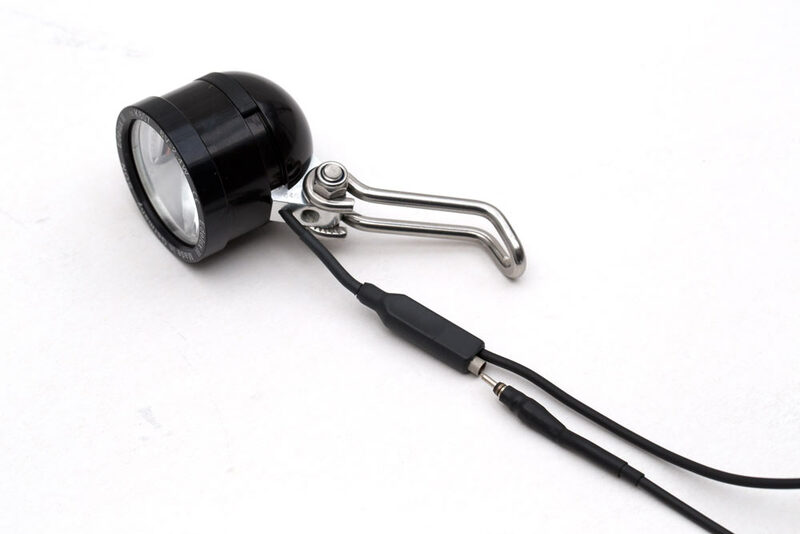 Now, you have just a single wire running down your fork to the hub, and if you use the USB-WERK or E WERK from Busch & Müller, you can easily remove its wiring from the bike, without messing with the headlight wire. Both Busch & Müller chargers have co-axial wire for their input, so the Schmidt Co-Axial Connector can be soldered directly to that input wire. We can do that here for you. Some chargers, like The Plug III from Tout Terrain come with a dual strand wire rather than Schmidt's Co-Axial wire, so the Co-Axial wire will first have to be spliced into the dual strand wire. It's not hard to do for anyone with experience doing electrical soldering. And of course we can it for you here. If you bought your charger elsewhere you can send it to us. Placing the Y Junction 80cm from the hub is long enough for most installations with the headlight mounted at the handlebar. Order part number SCH72635 for the 80cm wire with Co-Axial Connector already attached. For other installations such as having the headlight at the fork crown, we have the Y Junction with 80cm wire but no Co-Axial Connector attached, as in the photo above. Then you can cut the Co-Axial wire to the ideal length and not have any excess wire. And see below for our assortment of Edelux II headlights with the Y Junction already installed. We now stock the Edelux II in Black with the Y Junction installed 6cm from the base of the headlight, and with 51cm of wire between the Y Junction and the hub. That gives you a 60cm length of wire from the headlight to the hub; perfect for when the headlight is mounted at the fork crown on most bicycles. It positions the Y Junction just behind the headlight in a vertical orientation. That's important if you ride in rain without the charger plugged into the Y Junction as water could cause a short circuit, and your light would stop working, though it wouldn't be damaged. 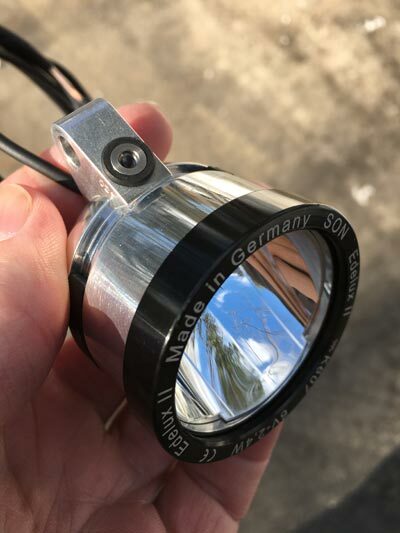 If this configuration of Black headlight with the Y Junction works for you, you'll save some money as we are having these made up in batches by little elves at a secret location deep in the Black Forest of Germany. The elves have teeny tiny fingers and can work very fast, and speak in high voices. If you need some other configuration, we can make it up here, but it will cost a bit more. The male Co-Axial Connector for the charger plugs into the bottom of the Y Junction and the wire then either runs up inside the steerer tube to The Plug charger, or to the USB-WERK or E-WERK wherever you have it on the bike. The USB-WERK and E-WERK from Busch & Müller use co-axial wire already, so the male Co-Axial Connector just needs to be soldered onto the end of the input wire. Labor to solder male Co-Axial Connector to USB-WERK or E-WERK input wire. We can make up just about any Edelux II with Y Junction your bike needs. Since we have the Edelux II in many colors with a 140cm wire, and since we have the Y Junction with an 80cm wire to the hub, you can tell us how long the wire needs to be and exactly where along that wire the Y Junction needs to be. We'll do all the soldering for you. These all include the Co-Axial Adapter for the SON hub. A 30cm Co-Axial wire with male Co-Axial Connector is available separately for when the charger's input wire is not co-axial. It can easily be spliced into your charger's dual strand wire. A male Co-Axial Connector is available to solder to the co-axial input wire of the USB-WERK and E-WERK from Busch & Müller. This version does not include the Co-Axial Adapter for the SON hub. Otherwise it's the same as above. It's for customers who already have a Co-Axial Adapter on their hub. Schmidt headlights do not include any mount. You must purchase a mount separately. See this page for mounting options. Here's the Edelux II on my Rambouillet. The mount is the Busch & Müller HD Caliper mount. There are two upside down versions! Both versions make the electrical connection to Ground via the mount. Both versions are available only in the polished finish. The most popular version has an On/Off switch, 140cm wire to the hub, and taillight connections. Unlike the regular Edelux II headlight, there is no Senso function. See the pretty pictures! The photo above left shows the Edelux II Upside-Down as it ships. Don't use it this way! Above right shows it how it is intended to be used. There's a crimping connector screwed onto the positive taillight connection. But here I just haven't crimped a wire onto the connector. The loop of wire in the background is for connecting to the hub dynamo. Now look at the two photos below. The photo on the left is how this light should be used if you do not have a taillight connected to the headlight. If you don't like the look of the taillight wire connector, just put a small washer under the screw head and tighten down the screw. Under no circumstances should you use the light as shown in the right photo. Without a screw in the threaded hole, water can easily get in when it rains and the water will cause a short circuit, and your headlight won't work! 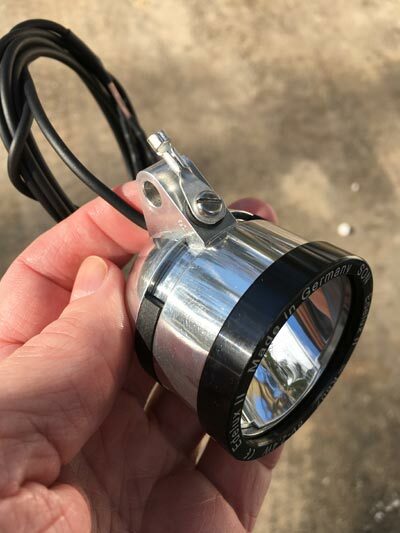 If you fabricate your own switch, or just plan to leave the headlight on all the time, you can get the Edelux II without switch and taillight connections. The lights look almost identical. But the version without switch has no wire to the hub dynamo. The connection is made via the mount, using the body of the mount for ground, and the top position screw for power. The bike's custom switch ought to have connectors for both the Edelux II headlight and the taillight. The headlight comes with connectors to attach to the wires you would run from the switch. The original E6 headlight with glowing ring. 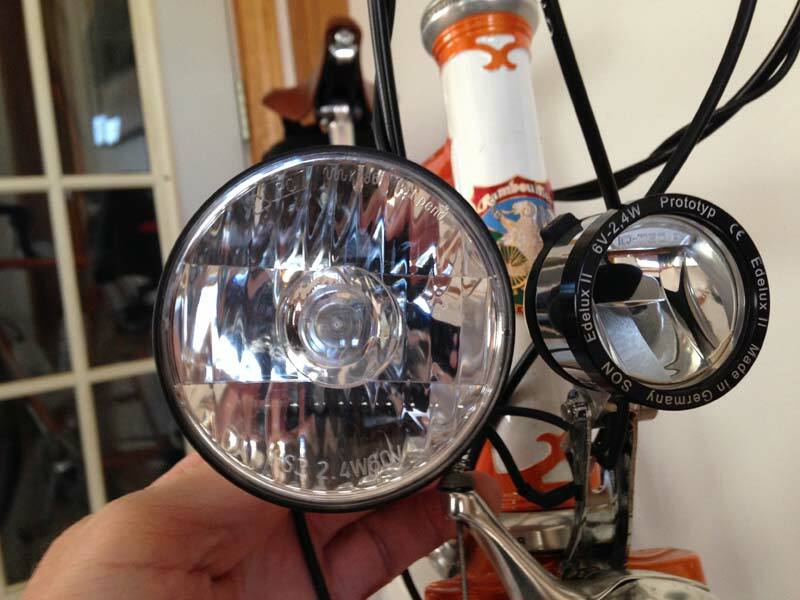 The halogen bulbed E6 headlight is without question the finest halogen headlight for bicycles ever made. While not as bright as the new LED headlights, the projected beam of the E6 is amazing. And many older cyclists prefer the color of the halogen bulb to the color of LED headlights and find it easier to see, even though the total light output is lower. Here's the later production E6 without the glowing ring, next to the Edelux II. The glowing ring was eliminated because recumbent riders were annoyed by the bright ring almost directly in front of their eyes. The E6 is available as a Primary or as a Secondary headlight. You may use the two together for the ultimate halogen headlight system. Since halogen headlights don't have as much power as current LED headlights, the halogen beams are narrower to concentrate the available photons. So you can use two E6 headlights and aim them side by side for a wider beam. But the two headlights cannot be identical. They must be wired differently in order to work together. Use the Primary by itself as the only headlight, or wired in series with the E6 Secondary (E6-Z). Use it with or without a taillight. If you have a wired taillight, use a 2.4 watt bulb. If you use the E6 Primary without a wired taillight, it must have a 3 watt bulb. We have both. When using the Primary with a Secondary, the correct bulb is still determined by whether or not there is a taillight connected to the Primary headlight. The E6 Secondary cannot have a taillight connected and can only be used with a 3 watt bulb. E6 Primary headlights are now sold out. We cannot get any more. We still have the Secondary, E6-Z available. 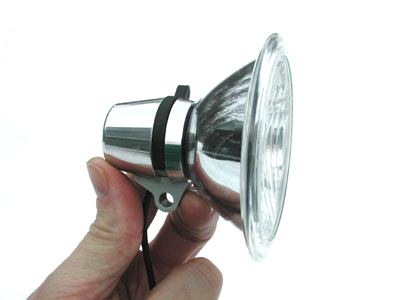 These work along with any Schmidt or Busch & Müller halogen headlight designed for use with a hub dynamo. That headlight would be the "Primary" in a dual halogen headlight system. The taillight would be wired only to the primary headlight. We also have the E6 available unswitched for use with sidewall dynamos like the Busch & Müller Dymotec 6. You could use this with a hub dynamo. But it will always be turned on, since it doesn't have its own switch. 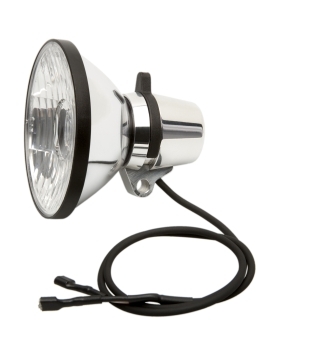 If you do a search on the internet for bicycle dynamo lighting systems, you will undoubtedly come across warnings about bulbs burning out if you ride your bike too fast. This is true of systems designed back in the 1920s, and used on bikes such as Raleigh three speeds up through the early 1980s. These were very crude systems by today's standards, with no voltage limiting. While you can still buy cheaply made dynamo lights that will blow bulbs on a downhill run, none of the systems I sell are so poorly made that you have to concern yourself with this, if used with a proper 6 volt, 3 watt dynamo. Without exception, every headlight I sell for use with either a hub dynamo or sidewall dynamo incorporates circuitry to prevent the overvoltage of the bulb. You have absolutely nothing to worry about. Schmidt Edelux and Edelux II headlights are made to be powered by a 6 volt, 3 watt hub dynamo. The use of Edelux or Edelux II powered by Velogical dynamos or other experimental generators risks damage to the headlight's electronics. Damage caused by overload through such generators is not covered by the 5 year Schmidt guarantee! We have quite a few taillights that can be attached to the headlight. If you use a taillight with a halogen headlight, you should use a different bulb than if you use the headlight alone. With an LED headlight, there's nothing to change in the headlight regardless of whether a taillight is used. Schmidt makes taillights for use with Schmidt headlights. These are also compatible with most Busch & Müller headlights. And all Busch & Müller taillights work with Schmidt headlights. But these issues need not be a problem. I have plenty of wire connectors here that can be used in-line, so that when you remove your rack, you quickly disconnect the wire right along with it. I get them from Radio Shack, and so can you, but I'm happy to give you some. Unbolting a rack is a lot more work than disconnecting an electrical connector that's designed for that purpose. And by using dynamo powered taillights, you reduce the need for batteries, the expense of buying new ones, and the hassle of being sure rechargeables are properly charged. Battery taillights are great for backing up dynamo taillights, in the rare case of a wire failure or circuit failure inside the light itself. Your SON hub equipped wheel is expensive. You can help keep it from being stolen from your bike by using a Pitlock skewer. If there is, I will not ship any Schmidt products to you. You must contact the importer in your country. If you have a retail bicycle shop, or are a bicycle manufacturer or professional wheel builder, you can purchase the SON hubs and lights, or built wheels for resale. Any shop in the US or Canada can purchase SON hubs and lights for sale in your store. Please call me for wholesale pricing on hubs, lights and complete built wheels with Wheelsmith spokes and Velocity rims built by Peter Jon White. Peter White Cycles is the official representative for Wilfried Schmidt Maschinenbau in the US and Canada, and we want all bicycle shops to be able to sell the SON. But, we will absolutely not sell any Schmidt products to bicycle shops outside the US or Canada.